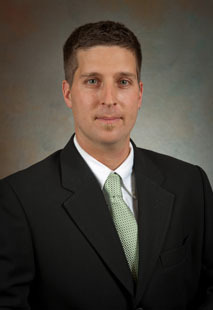 Gregory M. Mocko joined the department in 2006. Dr Mocko teaches courses in engineering design, computer-aided modeling, design informatics, and foundations of mechanical systems. He is an active member of ASME and serves as the Clemson University Student Chapter Advisor. In 2008 he won the Department Ken Roby Advising Award for excellence in undergraduate advising. Dr Mocko actively contributes to the Design Society and the Computer and Information in Engineering Division of ASME. Engineering design processes and tools, computer aided engineering design and analysis, information and knowledge management systems, functional modeling, requirements and customer needs analysis. Sen, C., Caldwell, B.W., Summers, J.D., Mocko, G.M., (2008), "Evaluation of the Functional Basis using an Information Theoretic Approach," Artificial Intelligence in Engineering Design, Analysis and Manufacturing (AI-EDAM) (in press). Ameri, F., Summers, J., Mocko, G., Porter, M., (2008), "Engineering Design Complexity: An Experimental Study of Methods and Measures", Research in Engineering Design. Chavali, S., Sen, C., Mocko, G., Summers, J., (2008), "Using Rule Based Design in Engineer to Order Industry: An SME Case Study", Computer-Aided Design and Applications, vol. 5, no. 1-4, pp. 178-93. ISSN 1686-4360. Mocko, G.M., Paasch, R.K., 2005, "Incorporating Uncertainty in Diagnostic Analysis of Mechanical," ASME Journal of Mechanical Design, Volume 127, Issue 2, pp. 315-325.